Eco-friendly or sustainable homes are no longer the preserve of ‘hippies’ or some mythical people from the future. They are being built here and now, and if you live in the United Kingdom (as well as many other countries worldwide) there may even be one near to where you live. If there isn’t yet there will be from next year when the Government initiated Code for Sustainable Homes is fully introduced in England and Wales. From 1 January 2010, level three of the Code for Sustainable Homes becomes mandatory for all new commercially built homes in England and Wales. The Code, has become a single national standard for design and construction elements which impact on the sustainability of a new home and addresses energy efficiency, water efficiency, surface water management, site waste management, household waste management and the selection of eco-friendly materials. The most significant part of the Code is the need from 1 January 2010 for all new commercially built houses to be 25 per cent more energy efficient than is currently the case, as applied through Part L of the 2006 Building Regulations. But that shouldn’t be a cause for alarm. The upshot is all new homes should be more pleasant to live in, will have lower fuel bills (because the houses are better insulated and less thermally inefficient) and will, in the main, look just like the house you live in now. That’s because much of the technology that makes them energy efficient or eco friendly is inbuilt in the fabric of the house and is invisible to all but the trained eye. So they will be better insulated in the roof space and cavity walls (places you won’t see). They’ll also have grey (bath and shower water) recycling inbuilt, which will be recycled for use in your toilet and washing machine. The building materials used in construction will be from sustainably certified sources. At a higher level of the Code e.g. Level 6 (the highest), which is zero carbon, it’s necessary for the homes to be powered and heated from renewable energy sources – solar, wind, or water or from the earth – and not from fossil fuels – coal, gas, oil – which when burned to produce energy emit CO2. So if you look around you at new houses, you’ll notice many of them have solar panels on the roof, and you may even spot the odd wind turbine. The Code for Sustainable Homes is the most robust piece of environmental legislation yet to have been implemented worldwide. However, several other countries are not far behind. In Spain, all new homes must be built with solar thermal for water heating. In France, legislation compels developers to install 40% of glazing facing south (for passive solar gain). In Portugal progressive measures have lead to around 11 per cent of its annual electricity requirements being provided for by wind power. AlmaVerde Village & Spa at Lagos on the Western Algarve, Portugal, was one of the first commercial resorts to adopt sustainable technologies to reduce energy consumption. The developer pioneered the Coolhose system, which ensures a constant 26C degree temperature whatever the external temperature whilst saving 94 per cent on CO2 emissions and energy consumption against the Portuguese average. 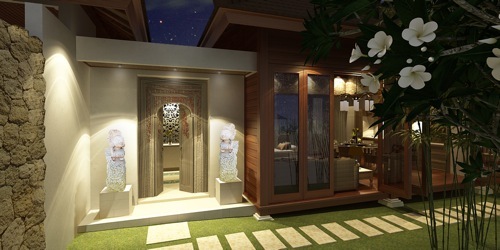 Local and sustainable building materials are utilised to build the villas, more than 60 of which have been built. Prices start from €550,000. 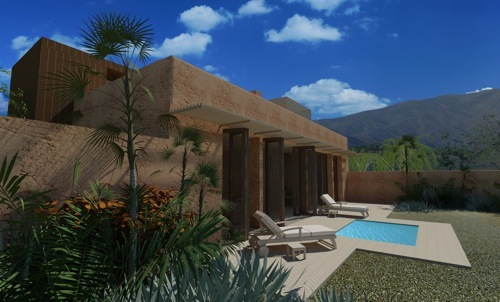 In Morocco, boutique retreat L’Amandier, which is located in the High Atlas Mountains, one hour from Marrakech, is being developed under a broadly environmental banner. The stylishly modern 16 two and three bedroom have been designed to maximise passive solar gain and retain heat through high thermal mass and insulation. Local and sustainable building materials are being utilised, including fenestration, doors and the aggregates used for construction. Prices start from £280,000. The British developers of L’Amandier, which is only 15 minutes from Sir Richard Branson’s acclaimed hotel Kasbah Tamadot, are engaged in initiating a local waste management system. The aim is to collect waste from local hoteliers, including Kasbha Tamadot, and villages, which will provide a much-needed service and also create local jobs and a greater civic responsibility. In doing so the environmental impact of poor waste disposal and CO2 emissions will be lessened. In Kenya, Medina Palms, an environmentally sensitive resort development of 50 villas and apartments at Watamu, on Kenya’s Indian Ocean coast, has a local and sustainable agenda. The British developers support the Born Free Foundation, and a local marine conservation initiative, Watamu Turtle Watch. Around 200 local jobs will have been created once the resort is completed in 2011. Onsite, hot water will be generated from solar power, and two underground biodigesters will be process greywater that will be reused for irrigation purposes. Prices start from £170,000. Across the other side of the Atlantic Ocean, Emerald Monkey Eco-luxe Resort & residences, located in the Bocas del Toro archipelago, off the Caribbean coast of Panama has been conceived as one of the world’s first carbon-neutral developments. The ambition will be achieved through the use of hydro electricity – a renewable source of energy – and energy reduction initiatives, such as LED, lighting throughout. Water will be drawn from local wells and recycled. Prices start from $75,000 for a one-tenth fraction of a one-bedroom villa; whole villas are priced from $565,000. It happened again this week; one of the most infuriating misuses of English language reared its ugly head. However unlike just about every other political scandal to have coined this vile term, this one actually had some bearing on my life. By attaching the word “Gate” to the end of a sentence this in some way helps create a higher level of panic, spreads fear at a greater rate and has Daily Mail readers reaching for their shot guns across the country.